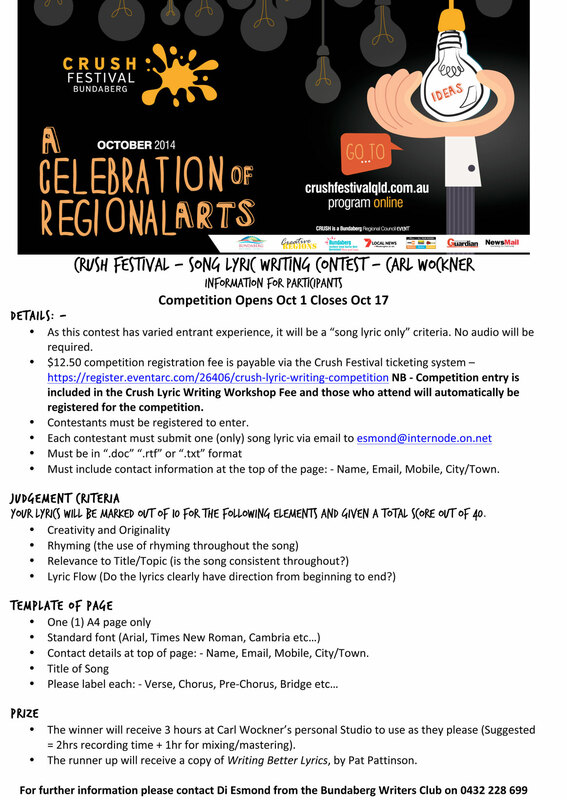 A reminder that, closing the Club’s musical participation in this CRUSH Festival, the lyrics writing competition closes October 17. And a reminder that you do not have to have attended the workshop to enter the competition. The good thing about workshops are they cut straight to the chase – no time for casual trawling through the net for conflicting ideas on how to write lyrics. Our workshop presenter, Carl Wockner, has been nominated for an ARIA – which is impressive enough – and will know the result before the end of OCTOBER. Since Carl is also judging the comp, it’s worthwhile knowing his views when you’re tweaking your words. Also, since Carl wants you to identify in your entry the VERSE, CHORUS, BRIDGE, PRE-CHORUS AND CHANNEL – should your words have them, that it might be a good idea to share his views with you below. listen to the songs you love. Look up their lyrics on the web and notice how they’re built. The chorus is the most important part of the song. It’s the part people remember and hum along with. Chorus contains the narrative hook. It stays very much the same if not exactly the same throughout the song. Verses ‘tell’ the story, sometimes in very abstract ways. From a novelists POV, they are like scenes. Verses rely on the chorus to remind people what the story’s all about. Verses change, and are hard to remember. Bridges turn the story. It seemed to me that a bridge was similar to a dramatic turning point in a novel, where you come into a scene believing one thing and exit believing another or heading in another direction. Bridges transition the narrative from scene to scene. Pre-chorus – leads into each chorus (as it sounds like it should). It’s a couple of lines of very chorus like words, ie they don’t change substantially, but they’re harder to remember because (from the lyricist’s POV) they’ve not got the narrative hook. And generally when the muso gets to them, the music it self might be transitional – a key change or something similar. Channel – a pre-chorus that is repeated but which evolves, grows and changes, each time it’s used. Not all songs have Bridges, Pre-choruses or Channels. You might also find an introduction useful. Write for yourself but never forget the audience. Choose a style/genre of music you like and consider writing for that style. You’ll know what subjects are common, and can think of ways to make old subjects fresh. We also learned on the weekend that three lines in a verse seems to trouble people with guitars and is generally thought to be not a good idea, and that few singers/songwriters get away with songs that go on for more that 90secs. People like Paul Simon are special in good ways. My own thought is they end up being both singer and songwriter (and producer!). Special tip: look at your lyrics and try them out as first person, second person and third person Points of view. All in all, many pointers echoed what we’ve already seen applied to novel/short story writing. It’s possible that writing lyrics might actively help develop a longer prose narrative. Sweet Home Alabama was mentioned. If you check out the lyrics you see it features an Intro, a pre-chorus, 3 choruses, and 2 Verses. That’s right, three separate sections before the verse kicks in – immediately after the first chorus. So a useful piece to demonstrate song structure possibilities. FYI Taylor Swift’s latest pop offering is filled with choruses, pre-choruses, refrains, and interludes. And verses, of course. A glance at experimentalist group Radiohead shows the chorus is often a two liner that can pop up anywhere, and that they seldom do intros – though instrumentally they favour an introductory piece. Nickleback’s (metal) newest has two choruses of eight lines each, a pre-chorus of two lines and three verses of four lines each, I think. Possibly. As the scent of cane sugar rises rich and redolent in the October air and the chuff of cane trains rattle their way through our psyche it’s that time of the year when Bundaberg celebrates. Yes, The CRUSH festival is here again. And this year the club will be doing a little cross-pollination of creatives when music and words come together. 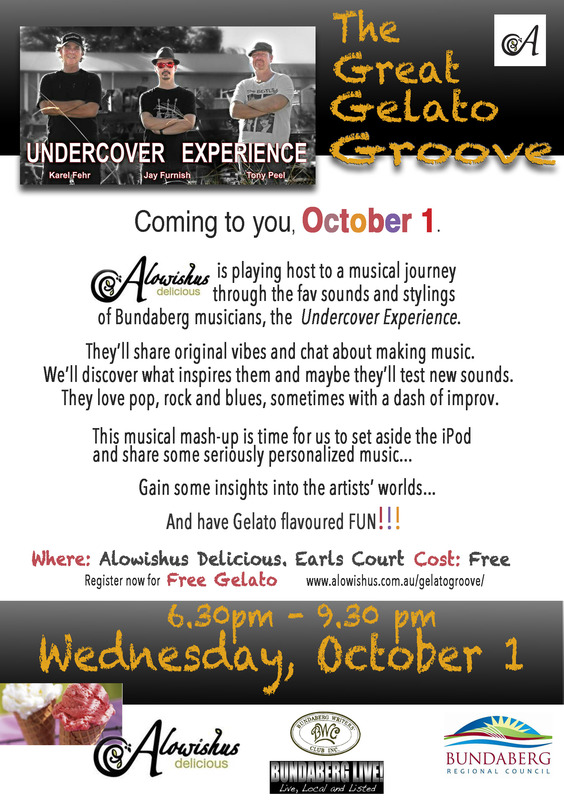 To start it all off with a bang, on Wednesday October 1, there will be the GREAT GELATO GROOVE at Alowishus Delicious. Register to get a free Gelato on the night. Undercover Experience will be sharing their music, but also offering a chance to chat about music: about what makes them do what they do; what they love (and hate) about music and, specially for writers, a little bit of insight into the wizardry that happens when words meet music in a brightly lit arcade in Bundaberg. Good food. Good company. Good music. PS. Our main show is a lyrics writing workshop followed by a Jam session with Musos to the max guided by Carl and the guys from Bundy Live. Sunday October 5, hosted by Carl Wockner, local lad and Scope Magazine’s Male solo Artist of the Year Acoustic and Vocals. Cost is $12.50. Register and pay on CRUSH Festival site. You’ll find more info there too.